Follow me if you will, back to the days of our ancestors. Back when this country was growing and many of our countrymen were moving from farms and ranches to cities and towns. Back when a work day went from sunrise to sunset in urban settings with very little green around. Those circumstances led to a movement to give people opportunities to get away from the cold dark factories to release their everyday tensions and frustrations in green spaces. They called that movement Parks and Recreation, and it has grown to become a staple in today’s society. Parks and Recreation is much more than just green spaces used as a respite from the rigors of everyday life – it’s blossomed into a necessary part of our lives. Parks and Recreation departments still provide open spaces, but it also serves as a testing ground for our youth to learn about leadership, develop self-confidence, and explore how to share and collaborate with others as part of a team. Recreation programming also teaches citizenship and helps law enforcement by directing negative energies into positive activities. And let’s not forget that recreation builds healthy bodies and minds. Even in our military, parks and recreation serves as an essential element to their overall mission of readiness. Recreation comes in many forms, from the active sport team experience to the quiet individual moment taken to read a good book. It provides us a time to re-create ourselves and re-energize our personal batteries. In our fast-paced society, it’s important to find time to explore new areas, experience new situations, enjoy life and to simply have fun! 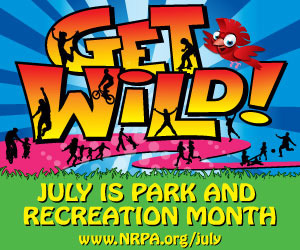 As we observe Parks & Recreation Month throughout July, we recognize that we’re blessed to live in a country where citizens can lead more balanced lives, thanks in large measure to the opportunities provided by the parks and recreation industry. This entry was posted on July 13, 2012 by City of College Station. It was filed under Parks and Recreation, Public Communications and was tagged with Parks & Recreation Month, Parks and Recreation.